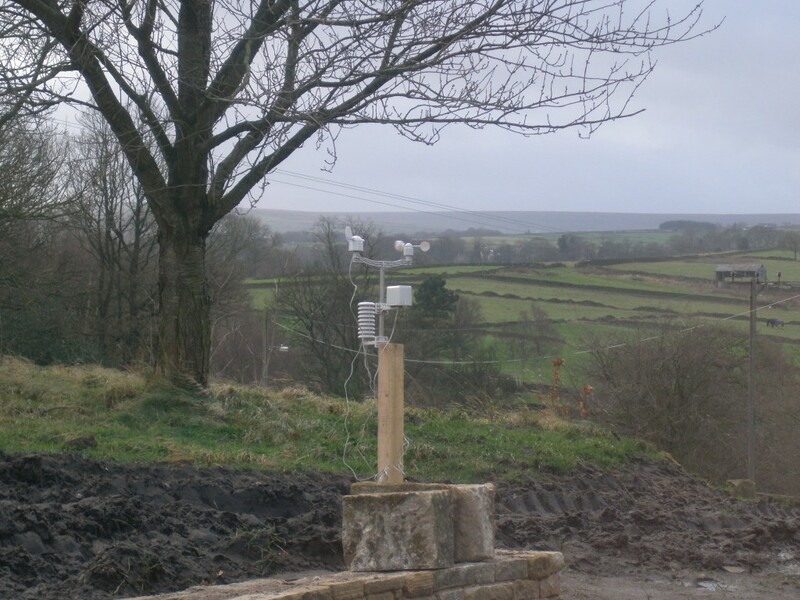 It has been quiet over Christmas, so I have taken the opportunity to move our online weather station. Although it has been up and running since January, it has been in the back garden of our house in the village rather than down on the farm. However, now we have a broadband connection and power, it seemed like a good idea to move it. I am still not quite sure of its final resting place, but for now I have put it at the far end of the sunken garden. Longer term, it is likely to be placed in the back field. I have put power and an ethernet connection there, so this is easily doable. However, that connection is currently being used to power the builder’s cabin, so it might need to wait until they leave site (probably in 3-4 weeks time). For now, the edge of the sunken garden will have to do! My customised webpages will be found here: www.haggleysfarm.co.uk/weather. You can also use the “live weather” button at the top of this page. The data is updated every 15 minutes. The wind speed and wind direction data on the gauges page are updated every 60 seconds. Obviously you need an internet connection to be able to do this, but the data that it is uploading is very small, so don’t worry about bandwidth limits. I am using a small format PC based on a mini-ITX board to upload the data. It has no screen or keyboard, but I can log into it via Remote Desktop. This means that I can log into it from a remote location. This allows me to reset the weatherstation on reboot the PC without physically having to be onsite. One of my frustrations is Windows Update – it updates the PC and then reboots it in the middle of the night. I have now set up Cumulus to autostart on reboot, but it still occasionally needs a nudge. It is running on an Intel Atom processor and although a bit on the slow side, it works perfectly for uploading the weather information. It also uses only about 70W and is very quiet. The weatherstation is temporarily sited in the far corner of the sunken garden. I have had this weather station connected to the internet for the last year, but it hasn’t been on the farm. It has been at our house up in the village. 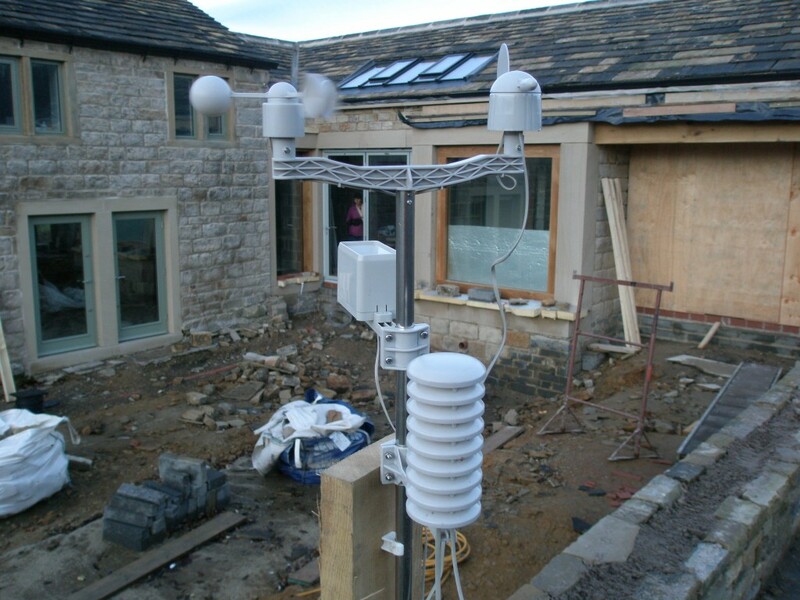 The ground source heat pump (and associated paraphernalia) was delivered last Monday. Over a week later and we are struggling to get it working properly. While it only took 2-3 days to get all of the pipework in place, it has taken the same amount of time again to try to get the air out of the system. If there is an airlock in the ground loops, the fluid will not circulate into the pipework under the field and we won’t be able to extract any heat. Through rather convoluted process, we managed to get all the air out of the system. This included flushing the ground loops with water to drive the air out, venting the ground loop manifolds and running the ground loop pump with no pressure (allowing the air to work its way out of the system). Once the air was out of the system, we checked the strainer only to find that we had picked up a lot of dirt while flushing the system. I guess this is what strainers are for! With the strainer removed, you can see the amount of grot that has been captured while the system has been flushed. 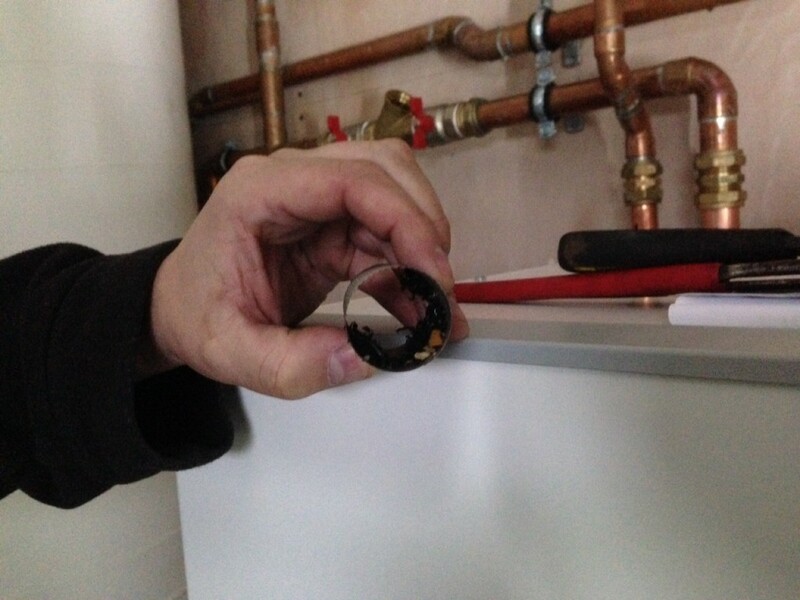 We thought that this would have been the cause of the “low pressure” alert on the heat pump, but sadly not (or at least, not the entire cause). Our plan was to run the system with water in the ground loops rather than a mixture of water and anti-freeze. This seems to be our next problem – the temperature of the water is reduced to a point where it will freeze in the heat pump without anti-freeze. Unfortunately to get the anti-freeze into the system, we need to hire a pump. In the meantime, the heat pump displays a “low pressure” alert after 20-30 seconds of the compressor starting. Due to the Christmas break this is going to have to wait until the end of the week. Top marks to Neil and Ricky from Sol-Air Renewables (www.solairrenewables.co.uk) who have really put some long hours in this week to try to get the heat pump up and running. In the meantime, we are using the heat pump’s immersion heater to slowly raise the temperature of the water in the underfloor heating. We have put the heat pump into “floor drying mode” and this slowly raises the temperature over a two-week period. Even though the ground loops aren’t working yet, we will be able to dry out the floors. Hopefully we will get some more progress towards the end of this week (most likely Friday). 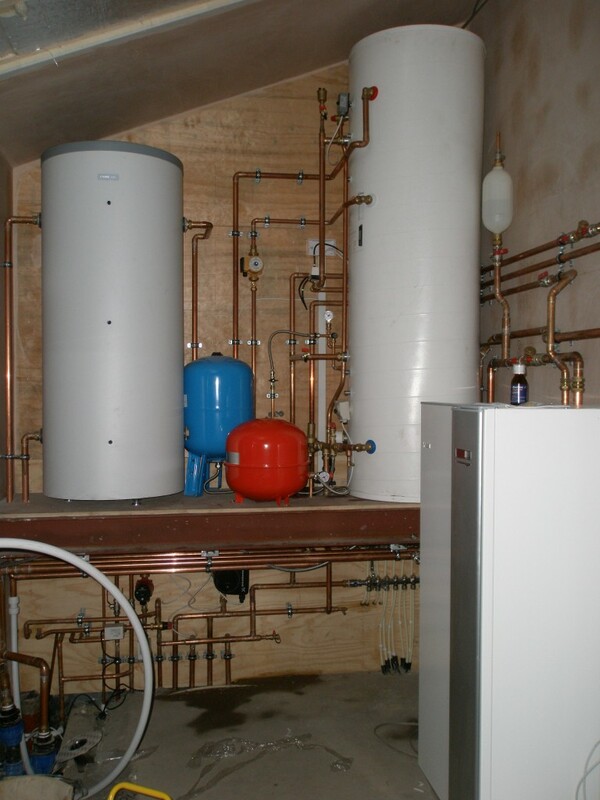 The ground source heat pump is the fridge/freezer to camera right, the large round tank is a 500 litre hot water tank and the smaller tank is a 300 litre buffer tank (it stores excess hot water produced by the heat pump). Ricky has done a great job of installing all of the pipework. The guys installing the cast iron gutters at the weekend referred to it as “the engine room on the Titantic”. Mmmm. I might see the funny side of it once it is working! In contrast to last night’s storms, today has been very bright and sunny. But cold – down to 3C. Here’s a photo that we haven’t seen before. If we ever sell the house, I would put money on the fact that the estate agent will take the photograph from here – it is beatiful rural view with no other properties in the background. I haven’t taken photographs from this angle before – from the opposite side of the valley. 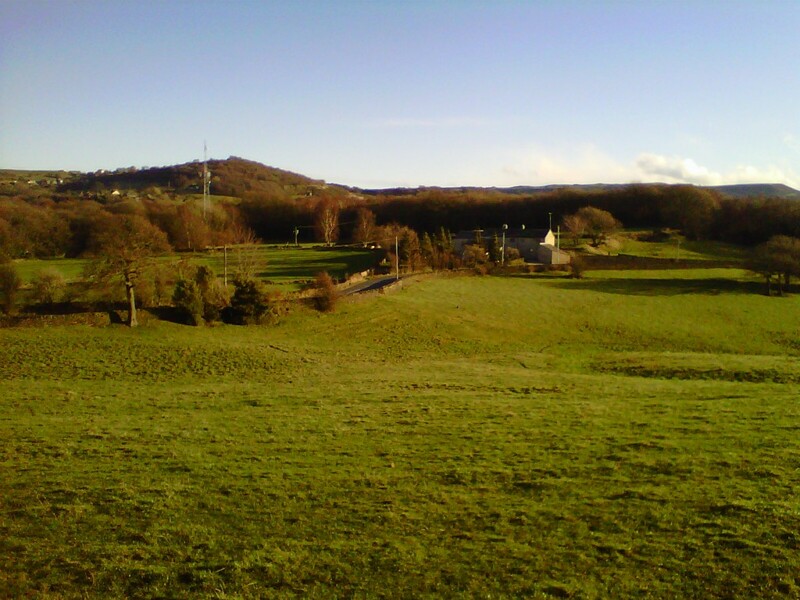 It was a gorgeous day today (Christmas Eve 2013) – cold but sunny – but I only had my Blackberry on me. It will be worth re-visiting with a better camera. 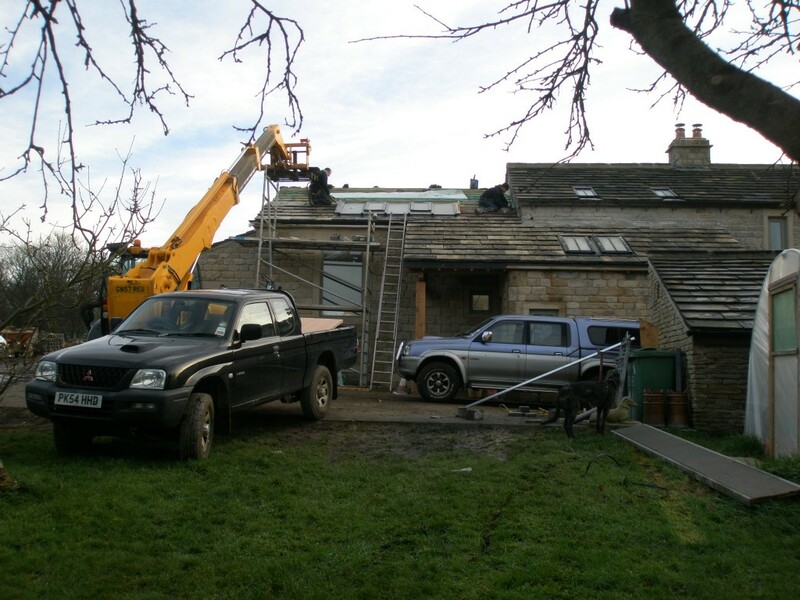 We have started constructing the canopy on the front elevation of the extension. This runs from the master bedroom and across the top of the large square oak window. It is made of marine ply with a section of wooden gutter inserted towards the front edge. This will then be covered in Sarnafil (an alternative to lead) to make it waterproof. Originally, there wasn’t going to be a gutter in this canopy, howcver, since it is outside the master bedroom, we decided that one was needed to stop water dripping off it during the night. The drain pipe will run down the centre of the pillar and then into a land drain. Up close, you can see that the pillar that is carrying the end of the oak beam has been pointed (only yesterday). The canopy will continue across and cover the large square oak window. There is a canopy over the bi-folding doors in the master bedroom. 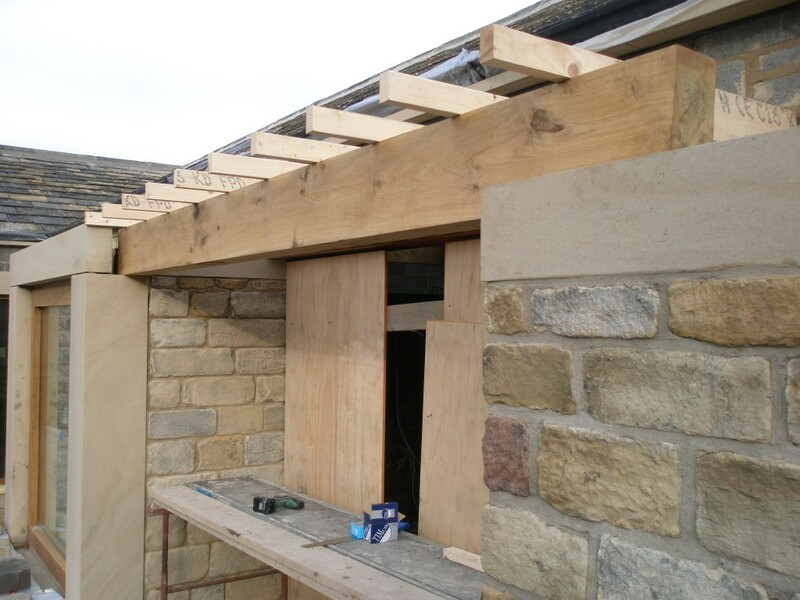 The canopy will be made from plywood with a section of wooden gutter towards the front (the spars have been notched to accomodate the wooden gutter). The canopy will be covered in Sarnafil (a lead alternative). 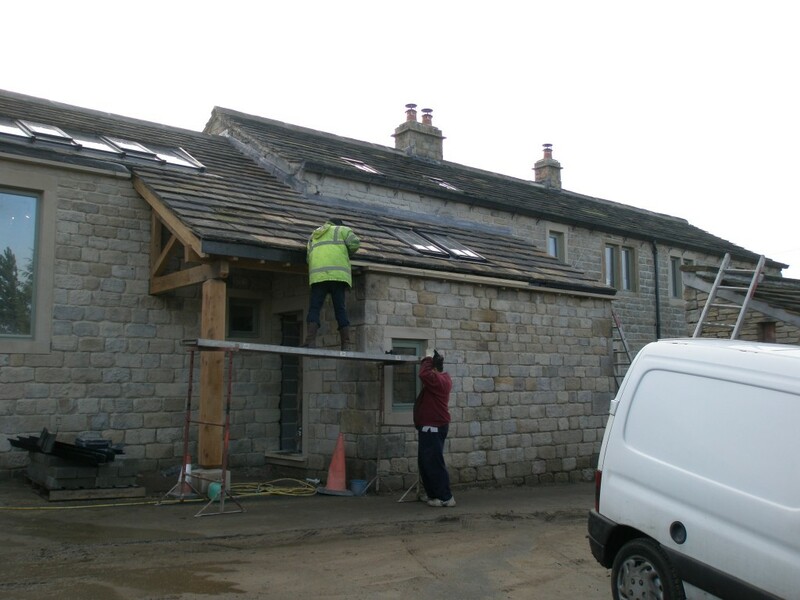 While we have started pointing the outside of the extension, we have also started on pointing the internal part of the extension. 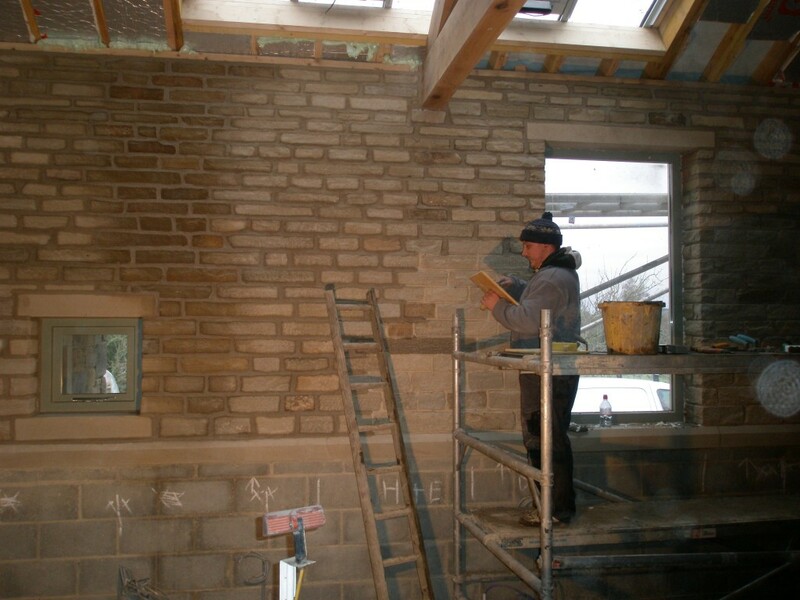 The internal face of one of the walls in the kitchen was built using stone that we reclaimed from demolishing a couple of internal walls in the old part of the property. Since it was raining for much of yesterday, it seemed like a good idea to get on with this internal work. With three people working on it together, it only took a day to get this work finished. We used the same lime mortar mix (based on Nosterfield River sand and hydraulic lime) as we have used on the outside of the property. 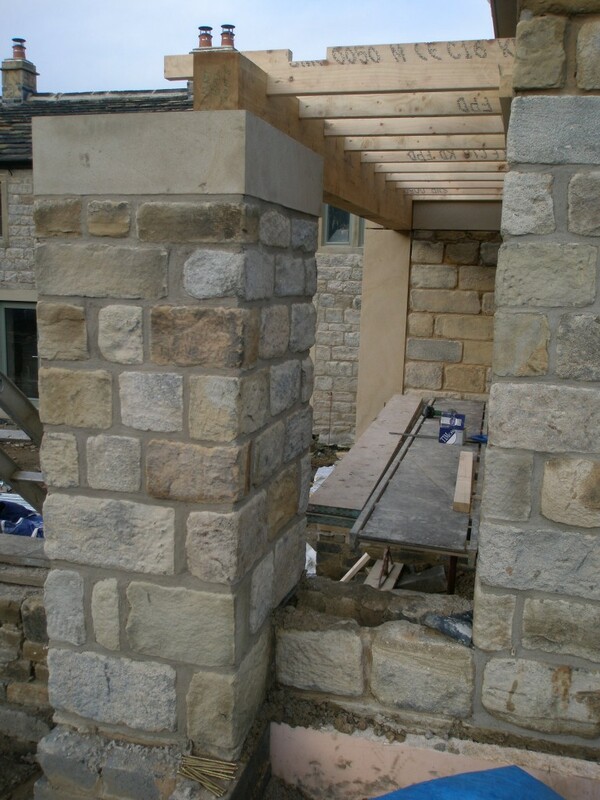 This internal wall has been built using stone from a couple of walls that we knocked down in the existing cottages. 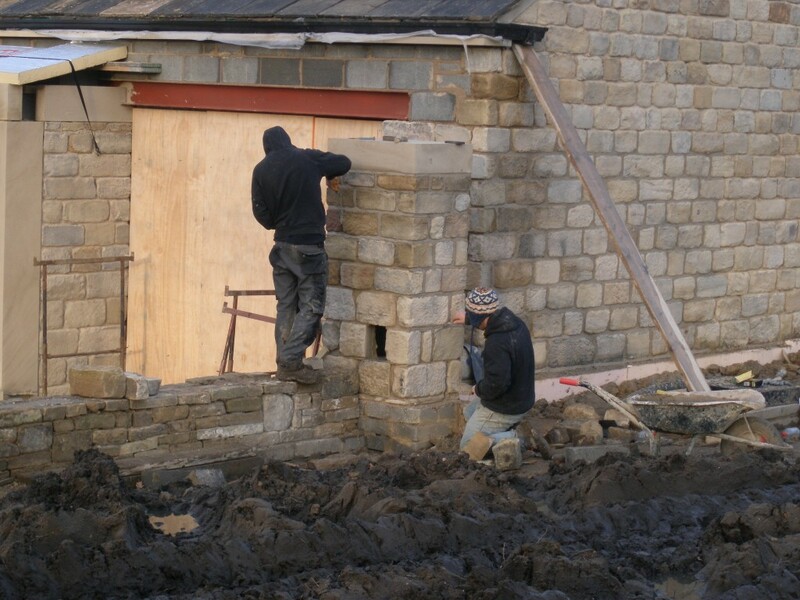 We are using the same lime mortar that we are using to point the outside of the building. The chalk marks on the wall are where the electric cables are placed – H + E = Hob and Extractor. 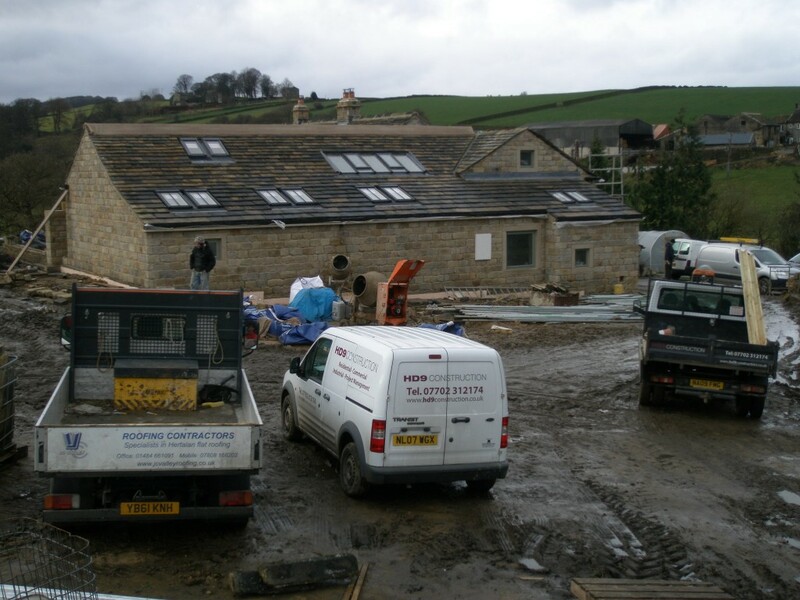 The ground source heat pump was delivered on Monday and we have spent the last couple of days getting it installed. Most of the pipework is now installed, however, there is probably another day’s worth of pipework to go. The electrician is due in tomorrow to start wiring it up. We hope that the system will be up and running (although in a limited capacity) by the end of the week. This will mean that we should have heat in the building over the festive period. Because we have laid new concrete floors these need to be dried out – and slowly otherwise we risk them cracking. We also want to dry out all the wood (particularly the oak) very slowly – otherwise there is a risk that this will crack too. As you can see from the photograph below, this kit takes up a lot of space. We have done the best job we can of reducing the amount of space it occupies (including installing a couple of steel beams to hold the tanks), but even so the utility room does look more like a plant room at the moment! If you are planning on installing this kind of kit, it would be wise to ensure that you have enough space for it. Our house isn’t small and we are struggling to provide enough space. It needs significant planning well ahead of installation time. This isn’t an issue that the providers make particularly clear when selling the kit (surprise, surprise!). The ground source heat pump (the unit that looks like a fridge/freezer) is a Nibe 1145. There is probably another day’s worth of pipework still to go in. 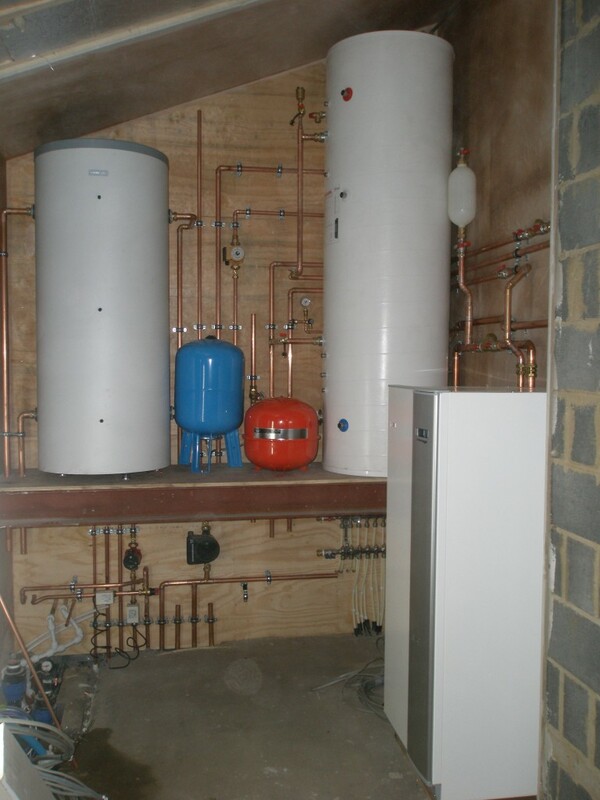 These systems are complex and take up significant space – this is starting to look like a plant room! 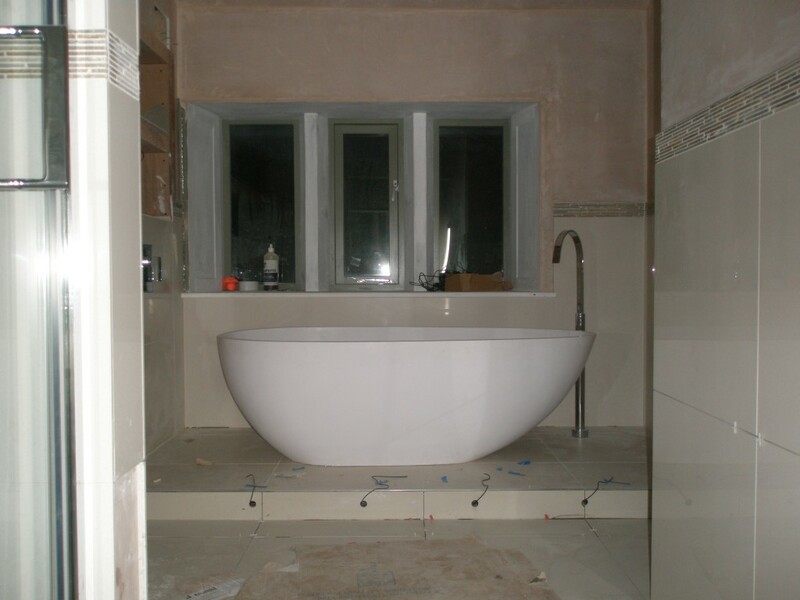 Although there is still some way to go to finish off the upstairs bathroom, the bath is finally in position. It arrived about 10 days ago and has been downstairs waiting for the tiling to be ready. It is a StoneKast bath that is made from limestone resin. It is heavy – very heavy – 170kgs. It took 5 plumbers to get it into its final resting place. There were smiles all round once it was in position. The bath is finally in place in the upstairs bathroom. It weighs over 170kgs and it took 5 plumbers to get it up the stairs and into position. I think there was a lot of relief all round once this was in position and still in one place.